A petition signed by 8,000 people opposing cuts in cross-Channel rail services has been handed to Eurostar. The petition, calling for an EU inquiry into the impact of the cuts, was taken to London Waterloo by a group of MPs and councillors from Kent. 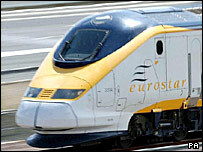 It follows plans by Eurostar to cut services from Ashford when the new Ebbsfleet International Station opens. The rail firm has said most passengers would find Ebbsfleet "either the same or less of a distance to travel". And the operator has also said it will monitor the demand at Ashford and keep timetables under review, but believes it has "got the stopping pattern right". But Eurostar said there would be an overall increase in international trains passing through Kent once Ebbsfleet opened, despite the Ashford cuts. Under the changes, Paris services will be cut from Ashford and Brussels services will stop. But Damian Green, the Conservative MP for Ashford, said: "We want Eurostar to play its full part in the future of Kent, and I hope they will listen to this very wide coalition of voices persuading them that they've got this one wrong." And Gwyn Prosser, Dover's Labour MP, added: "If Eurostar have got any concern about their reputation and what people think about them, then they should change their views now." Kent County Council said a former teacher from Ashford, Edith Robson, had gathered the petition. The council said it had run an online poll into the future of Eurostar services, the results of which will be published this month. But a spokesman said on Tuesday: "According to the poll, the vast majority of Kent residents would prefer to travel to the continent from Ashford."